WEST LAFAYETTE, Ind. 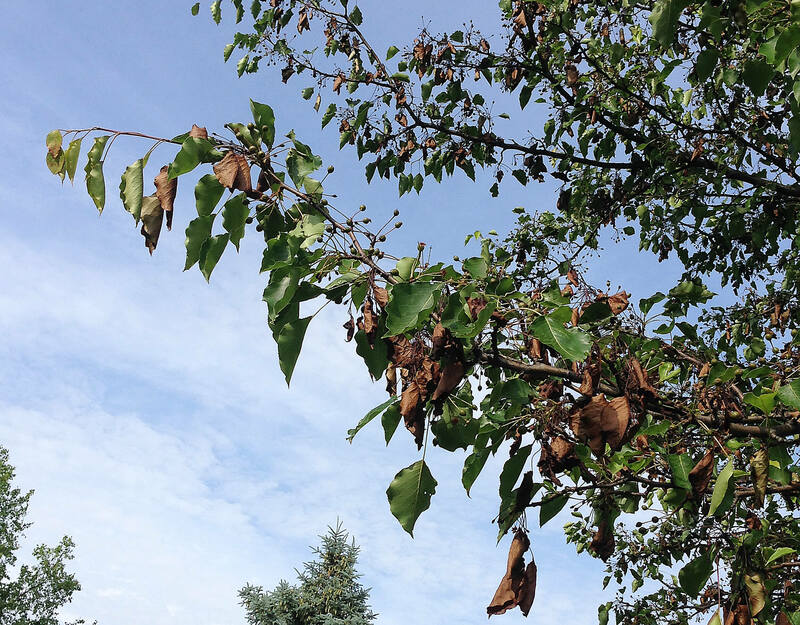 - Fire blight is infecting flowering pear trees in large numbers in Indiana for the third consecutive year, with a Purdue Extension specialist again urging homeowners to check their trees for symptoms. Symptoms of the potentially deadly disease with no cure are wilting shoots, cankers on branches and blackened leaves, which give the disease its name because trees appear to be scorched. Purdue plant pathologists have been receiving many inquiries from homeowners about the condition of their trees in recent days. Staff at Purdue's Plant and Pest Diagnostic Laboratory also are hearing from tree owners about the problem, said Tom Creswell, director. “We've been fielding calls about fire blight and receiving samples this week,” he said. The harsh winter may have caused freeze damage to buds and twigs, leaving openings for the bacteria and making trees more susceptible than usual. Severe winter weather and hail storms injured trees, allowing the fire blight bacteria to infect wounds. Flowering pear trees are popular in home landscaping, and a single neighborhood could have dozens of affected trees. Beckerman said afflicted trees might not have been properly pruned to remove fire blight last year, requiring cutting 12-18 inches below the dying branch because the pathogen spreads inside the tree beyond where it is visible. If it spreads to the main trunk, the tree may quickly die. Severely damaged trees may have to be removed. But before homeowners prune a tree themselves, they should review steps outlined in Fire Blight on Fruit Trees in the Home Orchard, a Purdue Extension publication by Beckerman. Improper pruning can further damage trees or spread the disease. The publication is available for free download from Purdue Extension's The Education Store. Beckerman and Lindsey Purcell, Purdue Extension urban forestry specialist, warned homeowners to beware of disreputable people who claim that they can kill the disease-causing bacterium with chemical treatments or injections. In some cases, the disease may have spread because homeowners were duped by the fraudulent claims for a cure. Purcell said homeowners can get reputable advice and service from an International Society of Arboriculture certified arborist. A directory of certified arborists is available on the Indiana Arborist Association website at https://ag.purdue.edu/fnr/Associations/IAA. They also can call the IAA office at 765-494-3625. Tree owners who have questions about fire blight can contact the Purdue Plant and Pest Diagnostic Laboratory at 765-494-7071 or go to www.ppdl.purdue.edu.